Are your HR and executive teams finding it difficult to plan and achieve your organization’s human capital needs? No worries! You are not alone. In fact, this is one of the most critical problems almost every organization faces today. It is a huge challenge as it takes a short-term toll on the time and energy of your HR team. Also, it impacts the company’s overall strategic planning, finances, and budget. Effective workforce planning is essential for a company to identify issues with repeated understaffing in several departments. If left unidentified, it can impact the efficiency of the organization, resulting in the inability to accomplish organizational goals. Therefore, in a bid to improve their productivity, collaboration, flexibility, and engagement, companies should take workforce analytics solution into consideration. Apart from maximizing performance management, workforce analytics solution also helps optimize the company’s results. 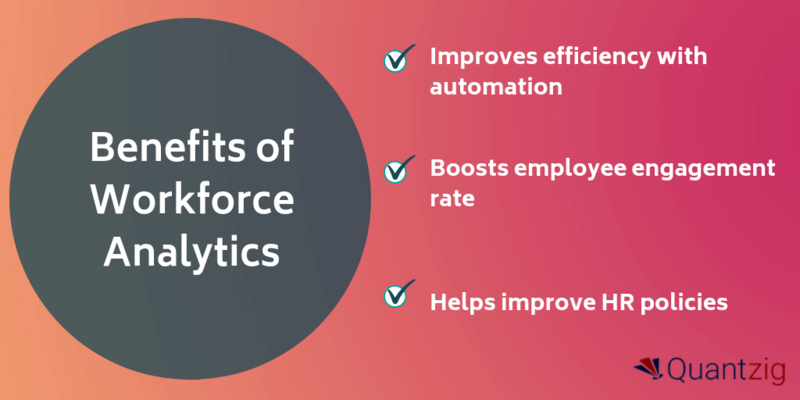 At Quantzig, we understand the difference that workforce analytics can bring to your business. And to help companies maximize their efficiency, our team of experts has highlighted five key ways in which workforce analytics can offer a sharper collective eye to the HR team and help them in identifying possible future risks. But before jumping onto to the benefits of workforce analytics, let’s understand what exactly workforce analysis is. Workforce analysis is the process of tracking and measuring employee-related metrics and optimizing an organizations human resource (HR) management and decision-making. This allows companies to focus on the return on value for every hire. Moreover, it helps analyze specific data to help identify workplace trends such as satisfaction with decisions, potential risk factors, and much more. By leveraging a workforce analytics solution, it is possible to analyze data to have a clear picture of the current situation and make improvements to their HR strategies. This can optimize business results. For any company, workers are their assets. Sometimes the tasks they do can affect their productivity or cannot provide the required results. This is where workforce analytics can help. By leveraging workforce analytics solution, companies can identify areas where tasks can be assigned to machines via automation. This allows employees to dedicate their efforts to other important and valuable activities. Are you facing difficulties in planning and achieving your organization’s human capital needs? Request a free proposal now to check out our portfolio of workforce analytics. Workforce analytics goes beyond firing and hiring information and helps companies to understand the reasons behind the inefficiency of their employees and discover factors impacting the productivity. It helps in maintaining the current workforce instead of replacing it. The goal of workforce analytics is to unveil those factors that affect engagement and performance and to overcome them by fostering better conditions. For business, finding new talent is always difficult regardless of a company’s scope or size. Workforce analytics can help in identifying exactly what is needed from a new hire based on the data of previous applicants, their success, and the needs of the company. Also, it helps in understanding new candidates based on their historical data to examine whether they would be a good fit or not.